I am THRILLED to bits! WHITE Magazine have featured our epic "Brid, Bride, Flight" photoshoot on their BLOG (BLOG link here). 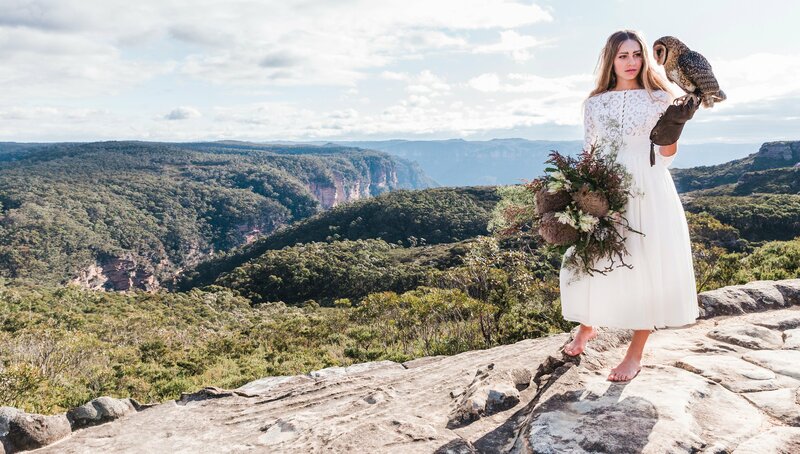 Scenic views and wildflowers are the canvas for this collaboration that I photographed in our local Blue Mountains bushland. The incredible floral bouquets by Edith from Floral Ink accented our gorgeous camelion of a model Sascha, who wore vintage lace dresses by Lost In Paris. Tania Bowers worked her magic with dramatic hair and make-up on a wind swept cliff top. Feathered Friends brought along their captivating owls to add another level of awe to this experience. The owls are trained as 'RING BEARERS" and you can actually hire them to fly your wedding rings into the cerremony! The dark clouds flew overhead and covered Bathurst in a blanket of snow that afternoon. It was a cold but incredible day.